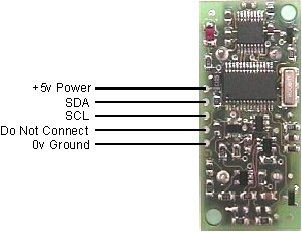 Communication with the SRF08 ultrasonic rangefinder is via the I2C bus. This is available on popular controllers such as the OOPic and Stamp BS2p, as well as a wide variety of micro-controllers. To the programmer the SRF08 behaves in the same way as the ubiquitous 24xx series eeprom's, except that the I2C address is different. The default shipped address of the SRF08 is 0xE0. It can be changed by the user to any of 16 addresses E0, E2, E4, E6, E8, EA, EC, EE, F0, F2, F4, F6, F8, FA, FC or FE, therefore up to 16 sonar's can be used. In addition to the above addresses, all sonar's on the I2C bus will respond to address 0 - the General Broadcast address. This means that writing a ranging command to I2C address 0 (0x00) will start all sonar's ranging at the same time. This should be useful in ANN Mode (See below). The results must be read individually from each sonar's real address. The "Do Not Connect" pin should be left unconnected. It is actually the CPU MCLR line and is used once only in our workshop to program the PIC16F872 on-board after assembly, and has an internal pull-up resistor. The SCL and SDA lines should each have a pull-up resistor to +5v somewhere on the I2C bus. You only need one pair of resistors, not a pair for every module. They are normally located with the bus master rather than the slaves. The SRF08 is always a slave - never a bus master. If you need them, I recommend 1.8k resistors. Some modules such as the OOPic already have pull-up resistors and you do not need to add any more. Get SRF08 Ultrasonic Sensor (SKU:SEN0007) from DFRobot Store or DFRobot Distributor.